New York, USA -- Two sides of the wall at New York's National Arts Club were adorned with colourful tapestries. What was different about them were the Thai mantras on some of the pieces. These images of Thai Buddhism were brought to the heart of New York by artist Jakkai Siributr. Entitled Strange Land, the exhibition posed the artist's question of how to be a good Buddhist in the modern world. `Dependents', vintage and commercial fabric, acrylic, charcoal, crayon. "Foreigners may not fully understand what I try to convey, especially in the pieces that have the Thai scripts. But I feel they don't have to," said the artist who was sitting on a sofa at the club. "This is similar to how the Thais don't fully understand the prayers in Pali or Sanskrit that they learn by heart." Strange Land showcased the artist's work on foreign soil from October 4 to 22, and it was the second time that New Yorkers could experience with their own eyes Jakkai's colourful tapestries. His work is no newcomer to strange lands. When Jakkai was about half way to finishing his work, it debuted at an event called Art Position in the Swiss town of Murten, in July. The complete exhibition of 12 tapestries was first previewed at Bangkok's Met hotel for one day in September before heading to the US. And after the exhibition in New York, it is now back here again. "This exhibition is a breakthrough," he said. "The pieces are still textile but adorned with paintings." velvet, industrial mesh, acrylic and charcoal. To some, this might not sound too exciting. But to the artist who has been trying for years to create harmonious pieces that are considered textiles but at the same time featuring some paintings, it has been a big challenge. "I'm satisfied with this exhibition," he said. "Adding paintings or cartoons to the pieces never worked in the past because the techniques didn't work." He explained that the obstacles in the past were from the restricted frame of thought instilled by one of his professors who said that textiles should not be representational but pure abstract. In other words, there should not be paintings on the pieces as the professor felt that textiles and paintings are two separate things that should not be mixed. So in his first show, the artist - who received his bachelor's degree in textile design at Indiana University and a master's degree in printed textile design from the Philadelphia College of Textiles and Sciences - exhibited two sections of work separately: Paintings and abstract textiles. Gradually, he tried to put the paintings and the textiles together, resulting in the elaborate tapestries being painted over by some images. In a later exhibition, he added the figures of animals by sewing them onto the pieces. But still, he said he could not find the right approach to combine the two until Strange Land. "I had been trying to create figures on the tapestries without making them look like quilts," he said. "It had been my struggle of how to escape from that." With the breakthrough, figures of creatures ranging from dogs and ducks to giraffes and rabbits dance around his tapestries freely. << Jakkai Siributr on home ground. "At first I wasn't sure how well people would receive the pieces which are the combination between abstract and cartoons," admitted the artist. "But it was quite well received in Switzerland. A lot of people were interested in my work, especially kids and the elderly. I believe I can really connect with people through my pieces." In addition to animals, which have been the artist's main subjects since the previous exhibitions, he has introduced the character of a black-faced, sullen-eyed man. "It's me," he said, adding that the figure reflects his self that is often preoccupied. According to Steven Pettifor, curator of the exhibition, the figures are "an admission to weaknesses within, with the artist feeling as if there is more than one person inside his head." The artist has been critical of what happens around him, especially events closely related to his daily life: Buddhism. Strangely enough, the pieces concerning religion do not have a single image of the Buddha or any representatives of religion. "Buddhism is the religious part of me," he explained. "I use it as a guideline in conducting and balancing my life." But the artist conceded it is not an easy thing to do since things are much different now comparing to the old days when the teachings were first given. "Because we hold on to concepts dating back thousands of years, we sometimes feel we are in a strange land," he explained. "To me, this doesn't really work since many of the teachings can't be applied to ways of living today." Some people lie to get away with things, he said. "I still drink alcohol and kill mosquitoes," he quipped. One point that the artist clearly states in his work is how people say the Buddhist prayers incorrectly or do not really pay attention to what they mean. This resulted in some mantras being distorted, repeated or blurred. In the piece entitled Dependants, words of prayers are scattered on the tapestries with Jakkai's image on the background. "It's no use praying every night but saying the prayers wrongly," he said while standing in front of this piece of art with a background of different shades of green and red. 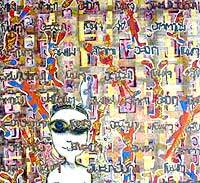 This concept is presented in a slightly different way in the piece called Day In Day Out, where tens of Thai alphabets are placed next to one another, separated by space and lines. The artist said these are the abbreviations of what he wanted to say and only he knew the meanings. "This makes no sense to others, just like how some people don't get it when they say the prayers in Pali and Sanskrit," he said. Many images of dogs are incorporated in his work, because man's best friend has taught him about life. "My dogs taught me about the uncertainty of life," said the artist who has raised eight dogs. "I used to talk to my dogs before they died ... that they should let go of life if it was too much suffering." For this new exhibition, Jakkai introduced some fabrics which he had never used before - cheap, gaudy material often used for costumes in Thai likay performances. "Two years ago, I used patterned cloth and silk most of the time," he said. "But now I have begun to let loose and have more freedom to create things, I feel it's a challenge to add cheap cloth to my pieces and make viewers feel they belong there." The artist said each piece in this set is connected by the stories behind them, not by similarities in appearance. In fact, the artist tried not to create them too much alike to bring variety to the collection. The idea of making pieces look disparate was initiated by the curator. "Some of the pieces are geometrical while others are freeform. In some pieces, velvet ribbons abound while others have more paint than cloth," he said. In New York, these tapestries were hung in a long room, like a hallway. Jakkai himself admitted that he was worried about the shape of the room. "Usually, the appropriate distance to see my works is to view them from a distance. But because the hallway was narrow, people have to view the works close-up," he said, adding that he came to New York to see the venue in January 2004 and started working on the collection then. "This intimacy has an influence on my work - it made me create more detailed pieces." The artist's concern soon turned into optimism. Because the hallway was the entrance to a building at the back of the National Arts Club and a library close by, there was regular traffic. Jakkai said he was not too choosy with the location, but why chose the National Arts Club, a venue that gives the impression of being old and not at all trendy? "H [H Ernest Lee] used to use this venue to organise some exhibitions long ago so he knows this place well," explained the artist. "We could have had the exhibition at Chelsea [a more fashionable part of New York] but the price would have been so high that we might have been able to only afford an empty room on the twentieth floor of a building where people would have to climb up stairs to see my work." He also added that his tapestries would look better in a rather old-fashioned room at the National Arts Club than in a plain white box, which would be too modern for his pieces. "It makes my pieces stand out better." Having exhibited his work in New York for two years, Jakkai said it is not easy for a Thai artist to be accepted there since it is extremely difficult to gain access to the local media and have them list his exhibitions in the papers. "There are hundreds of galleries in New York so there's a lot of competition to even get a two-line listing of the exhibition in the New York Times," he said. "I couldn't gain any access to the media last year. But this year is better as the art magazine FiberArts came to cover my work." FiberArts is a magazine about contemporary textile arts and crafts. "I love the work," said Pamela Scheinman, a writer for FiberArts who teaches Textile Design at Montclair State University in New Jersey, in an email. "It's beautiful, playful and profound in its layering of ideas." hangings use a structure typical of pieced quilts called 'Log Cabin', where strips of fabric are sewn in a square pattern that resembles the arrangement of logs stacked to build the walls of a rustic cabin," she said. Being featured by the magazine was like a dream come true. "I used to dream about being written about in FiberArts when I was at school," he said. "It feels so surreal now it's actually happening." The artist still remembers vividly his first exhibition in New York. "What made me happy was that three people that I met - a 10-year-old girl, a waitress and an old lady - said they liked my work. It really made my day to have three people of different ages stop and look at the tapestries," he said. "But this year, tens of people at the launch of the exhibition liked it. I feel more confident." Jakkai sees exhibitions in New York as an investment in his career. Going "international" is a career choice, he said. "The art circle in Thailand is relatively small," he said, adding that art is universal so there is no limitation that it can be exhibited at any place in particular. "There is a bigger place to be." Although the path to international acceptance may not be easy, Jakkai does not seem discouraged. "I give it all in every piece," he said. "And I hope people are able to see that my tapestries are full of life. I put my life and my heart into every piece." 'Strange Land' will be at H Gallery from December 6 to January 23. For more information, contact H Gallery on 01-310-4428.